1. Old Navy's Diva Skinny jeans — I feel like I've raved about these jeans at some point in the past, but I felt they were worth mentioning again this month. My first pair had all but fallen apart (I wore them do death, pretty much) and my parents had given me some birthday money, so I decided to buy not one, but two pairs of these jeans. I love that I've found a style that I don't even have to try on before buying. I know they'll fit and that I'll love them. I ended up getting two different washes, and went for the short size in one and the regular in the other. I'm 5'4" and either one works great, but I liked having two options, depending on what shoes I was wearing. 2. The Useletter from Amy Lynn Andrews — I don't remember how I found about this email newsletter, but I'm so grateful I did. Each issue is filled with tips and links to awesome resources for bloggers, freelancers, business owners, and creatives. I rarely sign up for email marketing these days, but I love this newsletter because it's like an email from a friend who just wants to share the awesomeness of the internet. I definitely recommend it! 3. Princesses on the Run by Smiljana Coh — My daughter, Eisley, is knee-deep in the princess phase of girlhood. And I'm not one to try to force her out of that, because I was definitely the same way as a young girl! However, whenever we're at the library she always, always runs straight for the Disney princess books. She is a huge reader (well, a pretend-reader at this point) and I've had to limit her to one princess book in each library haul. I've found that many of the princess books are super shallow and a little annoying to read, to be honest. When I found a non-Disney princess book (featuring the familiar princesses! ), I snatched it up right away. If you're a mama (or auntie or grandma) of a girl who loves anything in the princess category, I totally recommend buying this book. The illustrations are gorgeous and the story actually is wonderful and (dare I say it?) empowering for little girls. Very fun, very quirky, very sweet. 4. Graphics Fairy — I didn't realize how many awesome graphics this site has until I was searching for things to print and frame as decor for the new season. In the collage above, I included two of my favorites: vintage owl and vintage butterfly. On this blog, you're able to search for pretty much anything under the sun and you'll find a bunch of images you can print or work with in design projects. You can find a full list of 50+ vintage Halloween images here, a few of which I'm sure I'll be using in October. Thrifty decor, ahoy! 5. Rifle Paper Co. Botanicals notebooks — My older sister bought me this set of notebooks and I'm already using two of them: one for my daily devotions, and one for notes at my weekly mommy group. These notebooks are the perfect size to tuck into my purse and the patterns are gorgeous. The price is right for something like this, too, if you ask me! Less than $12? Yes, please. So, how about you? Tell me what had you swooning this month! — Further reading: Things that made me swoon last month and last year. I absolutely love those notebooks. I keep one in my purse at all times (just in case, reminders, etc.) and I'm all about the botanical persuasion. I love the Graphics Fairy owl, too! So cute! 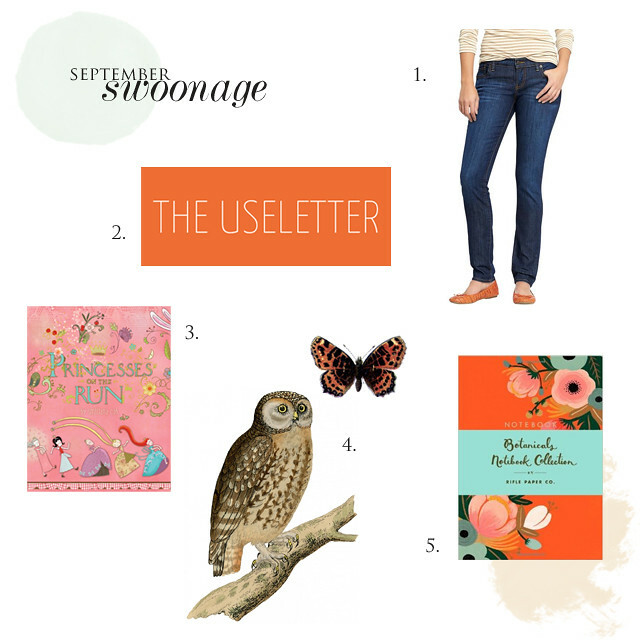 This month, I am swooning over my wide Instax, my Minnetonka moccasins (perfect for work), and my new orange mint plant. I love a good notebook -- and those are adorable! I always enjoy your monthly round-ups! :) I am really intrigued by the skinny jeans from Old Navy! I love those notebooks! I used to love the jeans at ON but that was back before they switched the names and sizing ... now I can't seem to find a pair that fits me properly! Oh my! Those notebooks are pretty!! Try Falling for Rapunzel. It's a cute twist on the original story.